Graduating from Lasalle College of the Arts was a dream come true for former inmate Kim Whye Kee. The 34-year-old sculptor discovered his passion when he made his first vase in jail. Since then, he has never looked back - graduating this year with a degree in fine arts. Yesterday, he told of his joy, saying: "It's a fantasy." Mr Kim was in and out of jail for around a decade after getting involved with gangs. 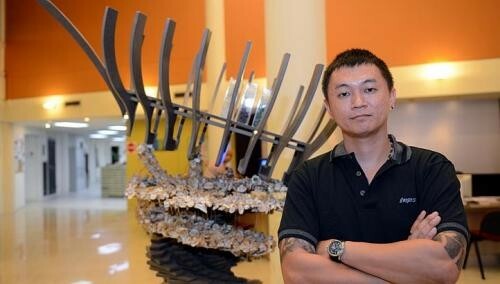 While behind bars, he completed a one-year Nitec electronics course and planned to find a place at a polytechnic. But his plans for a stable jobchanged when he took a prison pottery course, which helped him to discover his passion for sculpture. Five years after his release in 2008, he is a grassroots volunteer in Deputy Prime Minister Tharman Shanmugaratnam's Taman Jurong ward. He has also started an outreach initiative for at-risk youth called Beacon of Life. Mr Kim, whose mother worked as a cleaner, said he never imagined he had a talent for art - or that he could be accepted by an art school. He told The Straits Times he is grateful to those who helped him pursue his passion after his release. "People feel that society has a narrow definition of success," said Mr Kim, who lives with his younger sister in a three-room Taman Jurong flat. "But I don't think it's true. I've been given so many chances. I never felt like an ex-offender, because people, especially the grassroots leaders, treated me like a normal person." One of them was Mr Tharman's wife Jane Ittogi, who helped him get started as a volunteer. Local artist Henri Chen Kezhan encouraged him to enrol in Lasalle, and helped him prepare his portfolio to get into the school. Grassroots volunteer Patrick Chan gave the young man a part-time job at his furniture company while he studied, and a monthly allowance of $1,000. Mr Kim, whose parents are divorced, is now working full time as a product designer at the same firm. He also helps former inmates to find work, educational opportunities and support through Beacon of Life. Last July, he ran a pilot programme that allowed about 20 Singapore Boys Home residents to learn to express themselves through art. Mr Kim said being able to help others, as he has been helped in his life, was his greatest achievement. "I never thought an ex-offender like me could contribute to society, and do anything more than integrating into society and holding a normal job."